For many women, obtaining pregnant isn’t as simple as it sounds. Fertility problems are quite common these days, so you are not the only one suffering from it. With the advancement of science and a lot of help is available now to deal with this problem. 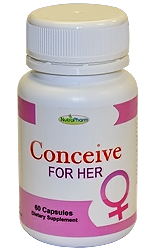 The Conceive for Her is a complete natural supplement, created by the perfect mix of vitamins, herbs, amino acids and minerals to assist improve hormonal imbalances in reproductive hormones like estrogen and progesterone that control a women’s fertility cycle. It additionally helps to support egg production and its overall quality and support a women’s uterus health. The recommended dose is 1 pill twice a day (usually morning and evening). Each bottle contains 60 pills which equals to a month’s supply. How long will do I have to wait before I become pregnant? Because this is a totally natural herbal product, it needs time to build up in your system. By taking this product you’ll be at a most fertility levels among three weeks of use, and typically conception can happen any time between then and three months from then. within the most rear cases it should take up to six months.